There are many articles out there telling indie musicians about all the cool ways they can make money in today’s music industry. However, all that money that you could potentially make probably won’t equate to very much if you don’t have an understanding of personal finance and budgeting. Without a sense of finance you could see your hard-earned cash going down the drain as a result of impulse buys, unstructured saving, and over-spending for your projects and tours. If you’re far enough along in your career, your manager or accountant may take care of budgeting and finance, but, especially in today’s industry, most musicians starting out may only have a friend or classmate acting as their manager. With all the stuff you need to get done, something as mind numbing as finance tends to get pushed under the rug in favor of more glamorous activities like recording, writing, and talking with fans on social media. But the fact of the matter is, it’s not glamorous to throw money away. And that’s exactly what you could be doing with poor budgeting and finance. So how can you get a better handle on your finances and get the most money out of your music? It’s actually a lot easier than you would think – no boring accounting lecture necessary! 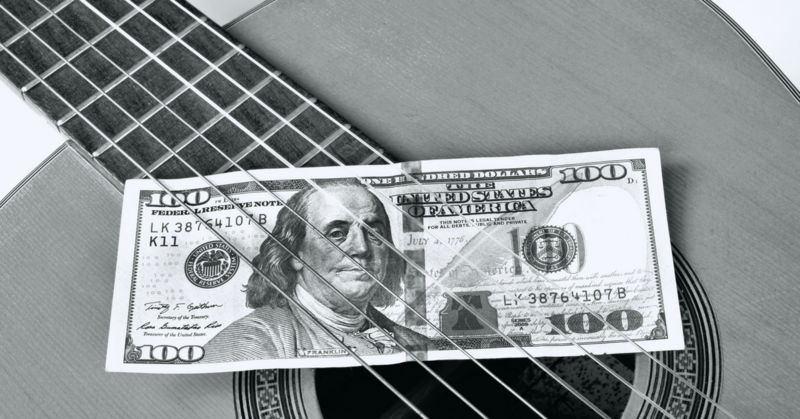 With just 5 finance tips for musicians, you can be more organized and make more money. The indie musicians who are truly successful think of themselves as a business and act accordingly. I know, it’s really easy to just pocket the money or split it up with your band mates on the spot after a gig, especially if you’re paid in cash. This method is fine if you’re a hobby musician, but if you want this to become your career, you’ll want to get more organized. A great option is to have a secure place to put the cash you get from live performances. Envelopes and small lock boxes are great options depending on how secure you want to be. The key is to make sure that everyone in the band knows where to put the money so it stays safe and accounted for. No one wants to be in the position of telling their band that they misplaced a couple hundred dollars! Beyond the gig itself, you’ll want to set up a separate bank account for your music income and deposit any money you get from your music in there. This will allow you to resist spending all your music income before dealing with the band’s expenses. Have a set time to pay your band members or yourself. This could be once a week, every other week, or once a month. It’s important to remember that you are all part of the business and should be paid in an organized fashion. We all want a big pay check, but saving is really important too. You need to pay for the band’s expenses, and pay your band members, but remember to leave something in the bank. Even better, take a little bit off the top and save it. If you’re just starting out and not making very much it can be a very small percentage. The key is to just get in the habit of saving something. This will be really beneficial when you are looking to record a new song or album or go on tour. Instead of having to ask band members to fork over money for the recording studio costs, you’ll be able to pull some dough out of your business bank account. A lot of musicians (actually a lot of people in general) hate spreadsheets and avoid them at all costs. But keeping track of your income and expenses is one of the smarter things you can do for your music career. As an indie musician, you have an extremely irregular income stream. Meaning you don’t bring a set amount each month. Your income is entirely dependant on the time of year, how often you gig, when you release an album, and a huge list of other variables. If you keep track of everything on a spreadsheet, your income becomes a lot more predictable. Set up a spreadsheet to track your income and expenses over a full year. Divide everything up into categories like touring, recording, and publishing (you could even get more specific) and separate everything into months. Have total income for each month and another for the full year. There’s no better feeling than being able to look back at your yearly income from a few years ago and see how much better off you are now. Aside from that, spreadsheets let you notice other trends in your career. You may find out that your average monthly income is $2,000 but it peaks above this in the summer months when you tend to gig more often. With these kinds of insights you’ll be able to avoid over-spending on the good months to compensate for the slower times. The important thing is to get organized. You can get a bunch of spreadsheet templates for keeping track of your income and expenses and budgeting projects in the New Artist Model online courses. Don’t wait for someone to come along and lay a big advance on you. Start making and distributing your music now with what you have. Just like entrepreneurs starting a business, musicians need to learn how to make money, even it it is just a little bit every month. This is one of the good musician habits to get into. This really goes along with the Lean Startup philosophy. Make your music as good as you can with the resources you have available, release it, get out and gig, make some money, and use the money you gained to create your next recording. It’s a slow process, but in the end it’s better than waiting for some advance that may never come or putting yourself into debt by taking out a big loan to record a full album. The important thing is to start your business by generating some income. When you’re looking to go into the studio to record some new tracks or hit the road for some gigs, take time to budget of all your expenses beforehand. Make a spreadsheet for each project that splits everything up into categories. For example, an album budget could include rehearsal studio and recording studio costs, equipment purchase or rentals, session musician fees, producer and engineer fees, album artwork and/or photography, and digital distribution costs. By laying all these costs out before you even go into the studio, you’ll have a better idea of just how much money you’ll need. If you’re figuring out the expenses as you go, you’ll always end up spending a lot more than if you plan ahead. If it looks like you’re going to go over budget you can choose to cut out that track that would require you to buy or rent a banjo, you could even record some tracks at home on your computer to cut down the amount of days you have to be in the studio. The important thing is to plan ahead and develop a strategy for success. I am a musician. I believe that this article will help me in my financing. Thanks for sharing this article. I agree with what you said. I think that saving is really a must not only for musician but for everybody. Thanks for sharing this.